Pay per click (PPC) advertising & return on investment go hand in hand, as no other advertising channel can so quickly display your website in the top search results precisely to get the traffic right away. Looking around for a trusted PPC services company in India! If yes, then Cognus Technology is a competent professional digital marketing agency that can facilitate you to obtain the most out of your paid search campaign with its team of 50+ well-qualified experts. Our 50+ SEO experts use their 5+ years of experience to facilitate businesses from 20+ countries helping them receive measurable and targeted website traffic. With consistent efforts and best practiced PPC marketing services we have successfully accomplished 1200+ projects to attain targeted leads. To develop a PPC campaign that’s perfect for you, we carry out competitive intelligence to know your industry, market share & measure your brand against competitors to set out a strategy for delivering the results you need. We help you identify the most appropriate keywords across the entire customer buying cycle. Our team analyzes and segments the relevant search phrases into core target groups to perfectly target your services & products to potential customers. Landing pages play vital role in PPC advertising to convert passive visitors into satisfied customers. Our content writing team prepares the text that the visitor has been looking for and that fulfills the commitment given in the PPC advertising copy. We test for multiple ad copy variants to decide which ad will bring the highest possible click-through and conversion. Though a strong call to action we make sure your adverts are getting the right traffic at the lowest cost. We run Ad extensions that tend to improve your ad’s visibility, which often appear above the search results rather than on sidebar. With this feature, we add additional business info to a basic text ad giving you a better opportunity over your competitors. Remarketing is an influential way to pump-up ROI & improve conversions by marketing to people who have already visited your website. We will work closely with you to build Adwords remarketing campaign that will bring customers back to your website. In our PPC advertising service we offer constant optimization that will streamline and focus the campaign for improved website traffic. Through landing page optimization, refined keywords list, geo-targeting, our experts push overall CTR. 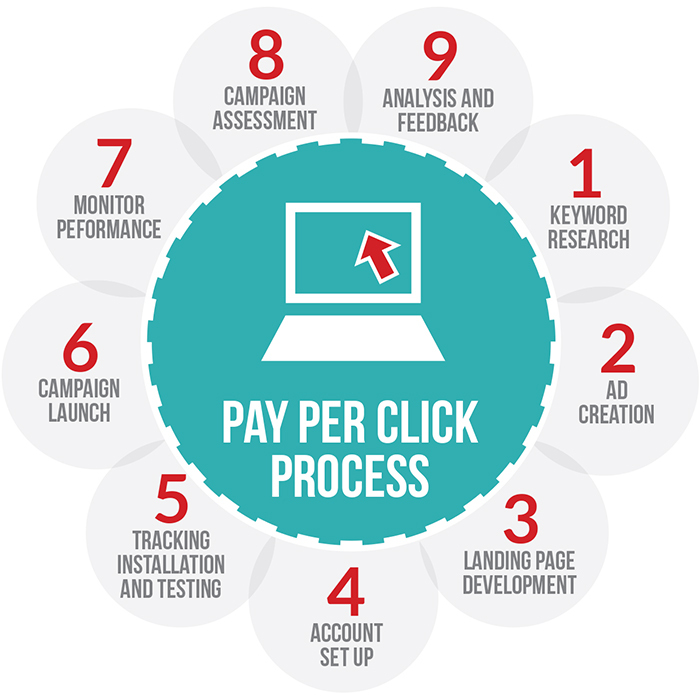 We set up tracking through tools like Google Analytics & produce reports providing significant insight into what is going on with the launched pay per click (PPC) advertising what has been achieved so far, how the paid search is executing against the key metrics etc. Why do our PPC marketing services rank amongst the best? PPC advertisements can begin & bring speedy results unlike SEO. Our team have proven their experience across businesses to bring quality leads and improved targeted traffic to client’s website at an affordable cost. Looking to partner with top PPC services company India that can help your business jump to the top of the search engines? Contact Cognus today!